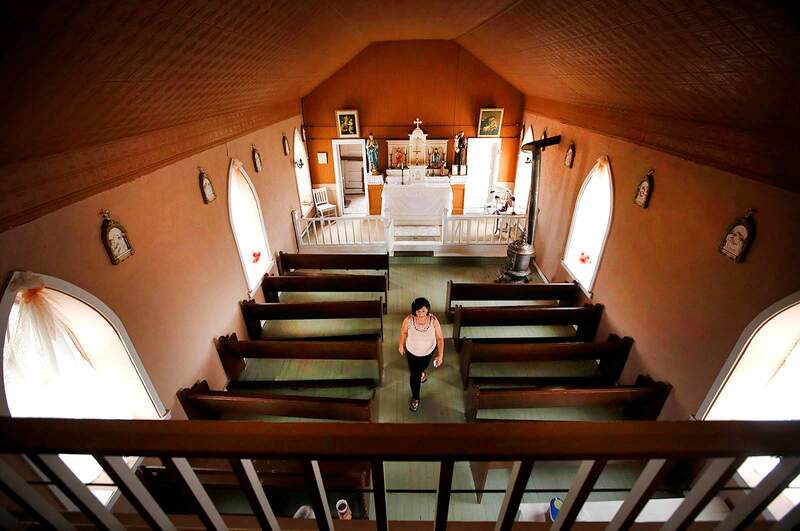 Margaret Muñoz-Lucero got a delayed Christmas present Tuesday: Iglesia de San Antonio Catholic Church in Tiffany was one of five places added to the Colorado Most Endangered Places list. “This has been like a calling for me, to get this church going again,” Muñoz-Lucero said Tuesday in a telephone interview. She was in Denver at a gathering hosted by Colorado Preservation Inc. to announce the 2019 additions to Colorado’s Most Endangered Places. “I attended as a child. My parents were caretakers,” she said. 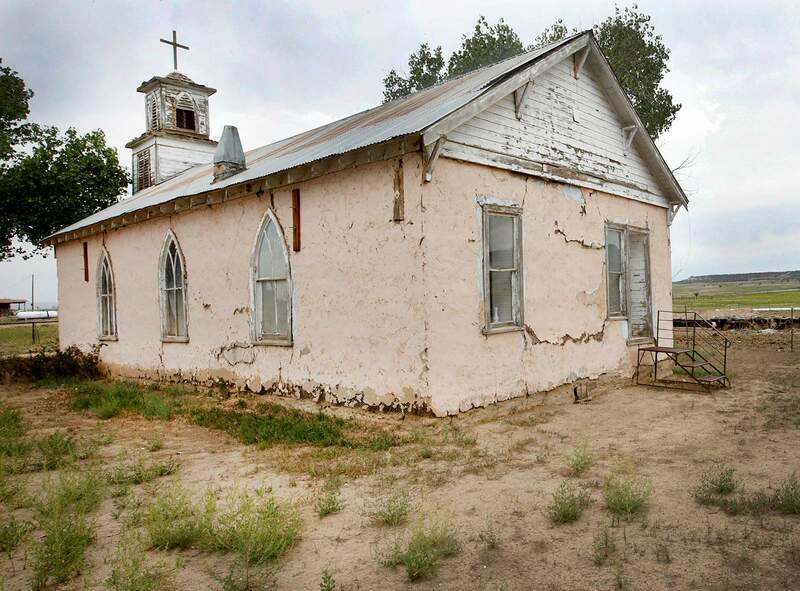 The church, built in 1928, is one of the few remaining original buildings built by Hispanic communities in southern Colorado and northern New Mexico who moved north in the early 20th century to create towns on the then-new route of the Denver & Rio Grande Railroad. Margaret Muñoz-Lucero attended Iglesia de San Antonio Catholic Church as a child. She led an effort to have the church placed on Colorado Preservation Inc.’s Colorado Most Endangered Places list. The church, built in 1926, was one of five places added to the list Tuesday. 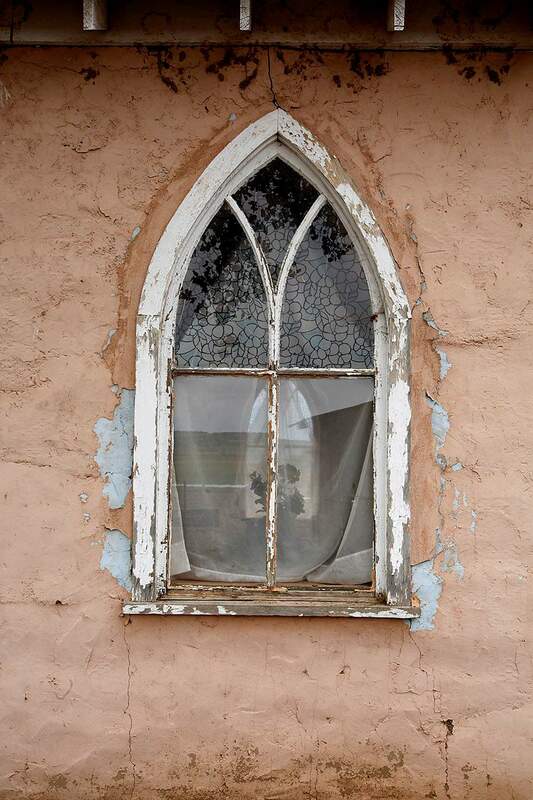 Kim Grant, director of Colorado Preservation Inc.’s Endangered Places program, said the church’s exterior is weathered and water is seeping into the original adobes and it has some foundation issues that require the expertise of an engineer and architect. The interior of the church, however, is in relatively good shape, he said, aided by a series of parishioners dating back to the church’s founding who have served as caretakers. “The caretakers were able to make limited plaster repairs, but the building has some foundation issues that require the expertise of a structural engineer and additional technical expertise,” Grant said. By earning a spot on the Most Endangered Places list, Grant said the church gains access to advocacy and publicity to attract preservation funds. It also gains access to technical resources available to Colorado Preservation Inc., to partnership opportunities with nonprofits interested in historic preservation and to fundraising organizations invested in historic preservation. The help couldn’t have come too soon, Muñoz-Lucero said. 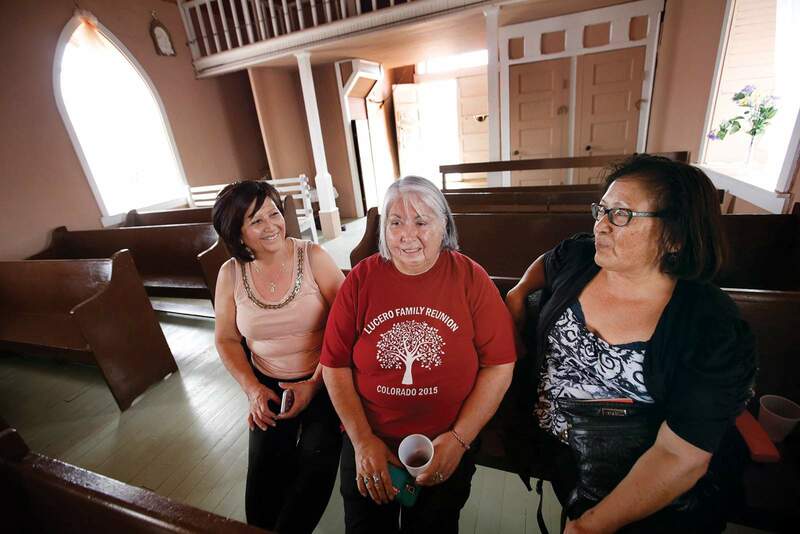 Margaret Muñoz-Lucero, left, and her cousins, Ignacita Olguin-Arias and Toni Semler, talk about their childhood days attending Iglesia de San Antonio Catholic Church in Tiffany, located about 10 miles southeast of Ignacio. Iglesia de San Antonio Catholic Church still hosts one Mass a year, to celebrate the feast day of St. Anthony. Mass this year will be at noon June 9. Last year, 87 people attended the Mass. Muñoz-Lucero, who currently serves as a caretaker, said after Mass everyone gathers at her house for a potluck celebration. 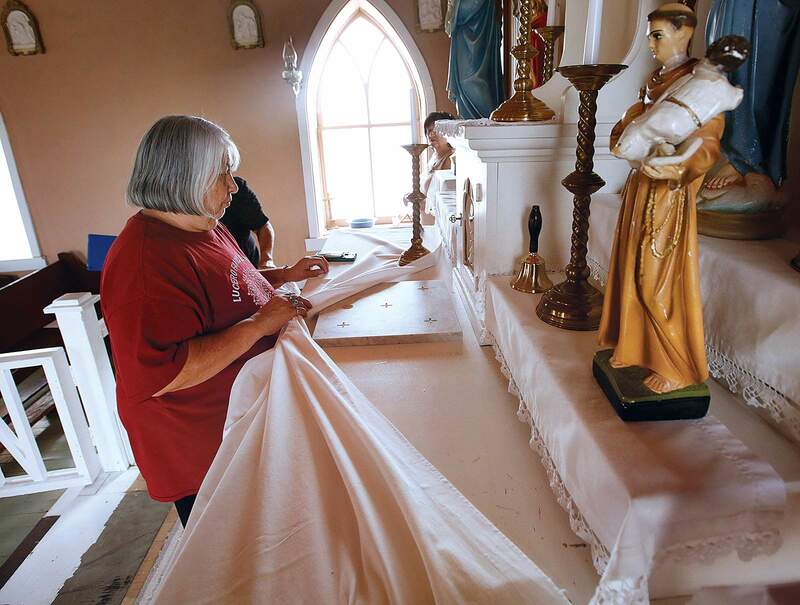 Last year, the church celebrated its 90th birthday, and by its 100th birthday, Muñoz-Lucero said she would like to see the church completely restored to its original state. 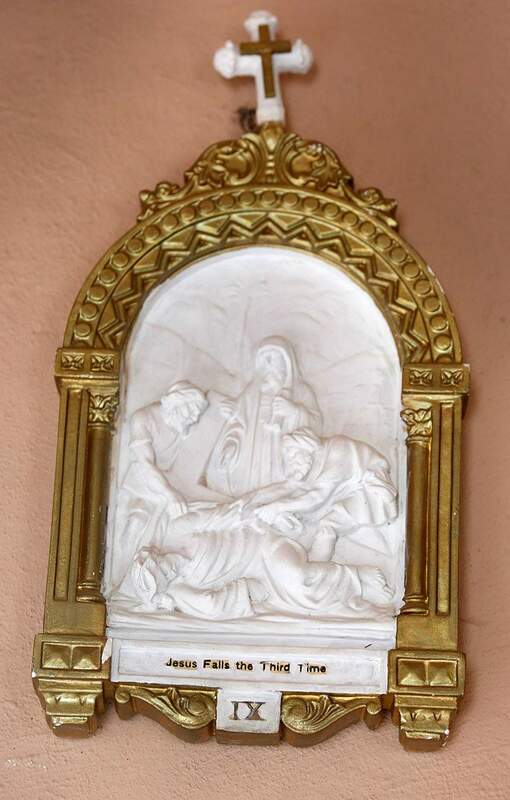 Ignacita Olguin-Arias uncovers the scared stone on the altar of the Iglesia de San Antonio Catholic Church. Once it is restored, she would like the church to serve as an adoration chapel and to host Mass every three months. The Iglesia de San Antonio Catholic Church, built in 1928 in Tiffany, has been slowly falling into disrepair. On Tuesday, the church was one of five places added to the Colorado Most Endangered Places list. Adobe potato cellars of the San Luis Valley (Alamosa, Conejos, Costilla, Rio Grande and Saguache counties).Hose Co. No. 3 Fire Museum (Pueblo County).Iglesia de San Antonio Catholic Church (La Plata County).McIntire ranch and mansion (Conejos County).R&R Market (Costilla County). Iglesia de San Antonio Catholic Church in Tiffany was built with adobe and now is covered with stucco. The stucco is weathered, old and cracking, allowing water to seep into the adobes, threatening the church’s walls. On Tuesday, the church was added to the Colorado Most Endangered Places list. Many original items in the Iglesia de San Antonio Catholic Church in Tiffany remain from 1928, the year the church was built.